The Dolly Blues are through to the quarter-finals of the Evo-Stik League Cup with victory against Marine on Tuesday night. In a game played in freezing temperatures, snow, hail and gusting winds goals from Reece Pearce and Tom Kilifin sent City through to quarter-finals of the Doodson Sport Cup. Reece Pearce opened the scoring, coolly slotting the ball home one on one late in the first half, before Simon Wearing inadvertently headed into the City net off the post to equalise. Tom Kilifin made his return to the City line up at half time, and on 57 minutes picked up the ball in the box and tucked the ball into the far corner from a tight angle to give Lancaster the lead. Visiting keeper Matthew Cooper kept the Liverpool based outfit in the game with a fantastic reaction save to deny Kilifin a second late in the half. Sam Bailey was sent off for a second yellow card with five minutes remaining, but City defended well to hold out for the win. The victory earned the Dolly Blues £250 in prize money and a spot in the last eight of the competition, with the draw due to be made next week. Lancaster next host Ossett Albion at Giant Axe in league action this Saturday. 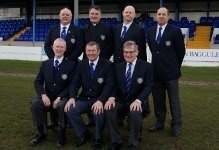  News: Rob Henry to Leave the Club The Dolly Blues' veteran full back is set to leave the club to join neighbours Kendal Town.